"This gravy is something that is a favorite in the family." Pour the turkey drippings into a saucepan, and gradually whisk in the flour. Bring the mixture to a simmer over low heat and cook until the mixture is a golden brown color, stirring occasionally, about 5 minutes. Gradually whisk in the turkey stock until the gravy is smooth; mix in a little water if desired. Season to taste with salt, black pepper, and celery salt, then simmer about 15 more minutes to thicken the gravy and blend the flavors. This was my first even attempt at making gravy and it turned out wonderfully! I didn't have celery salt so I used celery seed instead and I used chicken stock instead of turkey stock. Very Yummy! I used chicken stock, as well, because it was what I had on hand. 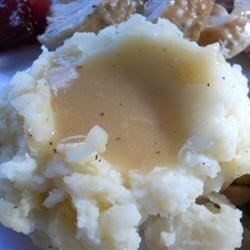 This will be my go-to gravy recipe for turkey gravy next year. I'm rating my modification as 5 stars. This is what I did. Instead of turkey stock I used 2 cans of vegetable broth (~15 oz). We didn't use any water, salt, pepper, or celery salt.